The Fists of Steel are a melee weapon for Heavy that, while active, grants damage resistance to all ranged weapons, but also take double damage from melee damage. Because they are not the GRU, they are often overlooked. However, I find the FoS to have at least a few interesting uses as well as a decent melee weapon, especially with a more shotgun/boxing strategy. First, let’s look over the downsides of this weapon. First, there is a passive -20% weapon switch speed. Obviously, this is so you can’t abuse the resistances, but it can create other conundrums. You need to know which weapon is needed, and you need to commit to your choice. If you are going to focus on minigun use, the Tomislav may be a good choice, with its faster spin up partially making up for reduced switch speed, although it’s not a huge benefit. The other downside is that while the weapon is out, melee damage is doubled against you. This is a mixed blessing. On one hand, most any melee hit will basically pop you, what with an effective 150 health. On the other hand, it brings enemies right where you want them. Heavy is at a disadvantage in melee, but some good practice can make up for it a bit. It could also be possible to bait people in close only to pop them with a good shotgun blast. The upside, a 40% damage reduction to ranged weapons, can be quite significant. With that you have effectively 500 health. The most basic use of this is to reposition. You can move about without worrying too much about stray fire or quickscoping snipers. Retreating is also a bit easier, assuming there is a reason for the enemy to not give too much chase. However, just because you can absorb damage a bit better, does not mean you should. Dodge and surf damage as much as you can. It should be noted that the Fists pair somewhat well with the Buffalo Steak. The resistance of the fists and vulnerability of the sandwich cancel each other out, granting only the bonus speed and extra damage. One must decide when more speed or more resistance would be more useful in each situation. It should also be said that full melee heavy is only useful in lower skill levels or just for the fun. The fists can make for a good cart pusher in some situations. With the fists out, hug up to the cart and don’t let go. Also use the cart as cover from fire as well as sentries to avoid some damage. This will also force them up close to deal with you, where you can lash out punching, but stay near enough to the cart. The cart’s healing should grant you enough stubbornness to push the cart a bit of ways, while the team either pushes with you or goes ahead and clears out the area to make room for the cart. Another, more unorthodox tactic one of my friends came up with was to guard friendly sentries. The heavy would stand in front of the sentry, absorbing incoming fire so the sentry can fire through the heavy and survive for much longer. 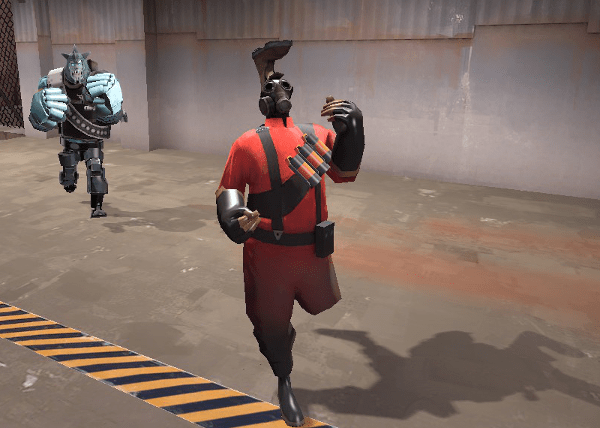 Meanwhile, the heavy receives constant health through the dispenser. While the Fists of Steel aren’t the best melee choice of All Time, I believe they should be checked out and have a few niche uses. Is that a Cr1tikal reference?